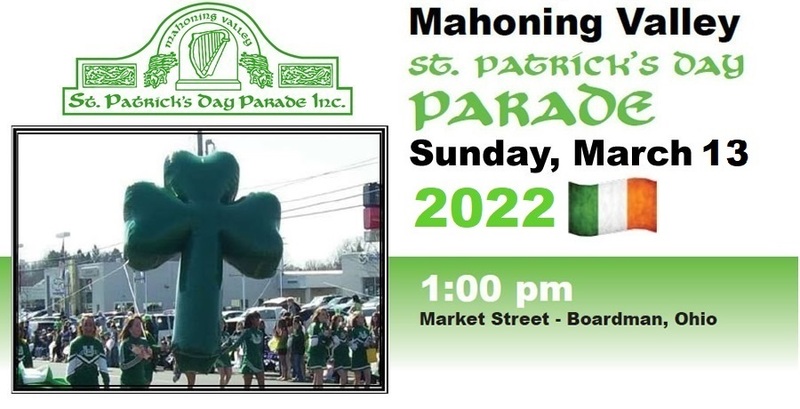 The 41st Annual Mahoning Valley St. Patrick's Day Parade will be held on Sunday, March 10th, 2019. The Parade will step off at 1:00 PM and proceed north on Market Street from McClurg Road to Southwoods Avenue. Boardman has proven to be an excellent venue for the Valley’s Biggest Parade. Co-sponsors of the Parade this year will again be the Mahoning Valley Irish Organizations, WFMJ TV-21 and The Vindicator. We are inviting you to join the Parade and 25,000 to 30,000 of the Valley’s finest spectators to celebrate this family tradition. The Grand Marshal for 2019 is Maureen Collins, our Lord Mayor of Kilkenny is Lenny Fisher and the Ockerman Award recipient is Buzz Kelty.